Live4ever Uncovers Noel Gallagher's Best Kept Secret? It seems that the community on Live4ever's forum might have cracked the music world's best kept secret and dug up actual information on Noel Gallagher's new solo album. 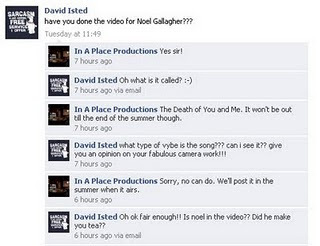 L4E forum member bonkers initiated a dialogue via facebook with LA Production company "In a Place Productions" last Wednesday and asked them about the reported video which they had shot for Noel Gallagher. Below is a screen shot of the communication. Noel Gallagher has named his new single 'The Death Of You And Me', according to a production company he has been linked with. In A Place Productions, a company in Los Angeles, posted a response on their Facebook page to a question about the former Oasis man's new video. They confirmed that they are shooting the clip for the track. They also said the song was called 'The Death Of You And Me' and that "it wouldn't be out until the end of the summer." The posting has since been taken down, and Gallagher's spokesperson is yet to respond to a request for confirmation or denial on the single title.